We are excited to announce the general availability of version 17.8 of the Backup Management Console. This update includes several usability, reporting and educational enhancement to the Management Console available at https://backup.management. New Feature Notification & Training – We’ve added educational tools to the management console to automatically inform you of enhancements. When you login you will be presented with a dialog to walk you through new features. Just follow the in-product navigation and prompts, to learn more. If you don’t have time to learn now, simply close the dialog and come back to the help menu later and click “How it works”. Here you can see the various training topics available, and we’ll even track your completion progress. This way you know what items you’ve reviewed and what is still outstanding. Additionally, you can look at the “How to’s” and “Resources” to learn more, search the Knowledge base, link to Release notes or submit Enhancement requests. 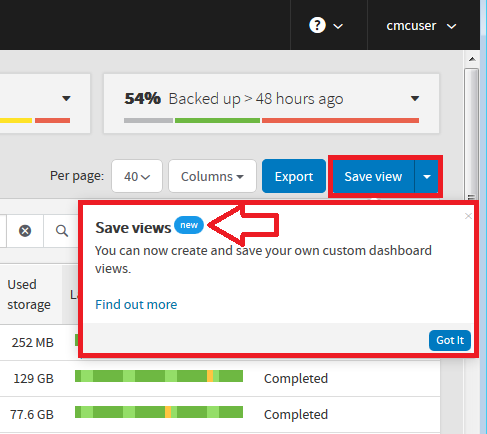 Custom Views – Save time and manage by exception with custom views that show you just the data that you need. Add and remove columns, drag and drop to change the order, filter and sort based on a specific customer, status, environment, configuration or other advanced filter. Once created, save and name the view to enable easy access from the management console or click export to download the current view as a .XLSX file. Emailed Views (Beta) – This Beta View feature delivers a snapshot of the data you want, to your in-box, when you need it. To start, Expand the view menu and click on “Email view”. Start by adding a new schedule date and time, pick or add email recipients, select one of your Custom Views and your set. Want a sample, just click “Send it now”. Note: Emailed Views are restricted to Reseller and End-Customer level credentials and are not accessible by Distributor or Sub-Distributor level partners. Please note that this update is specific to the standalone version of Solarwinds Backup and does not include a corresponding update to the Backup Manager client software. 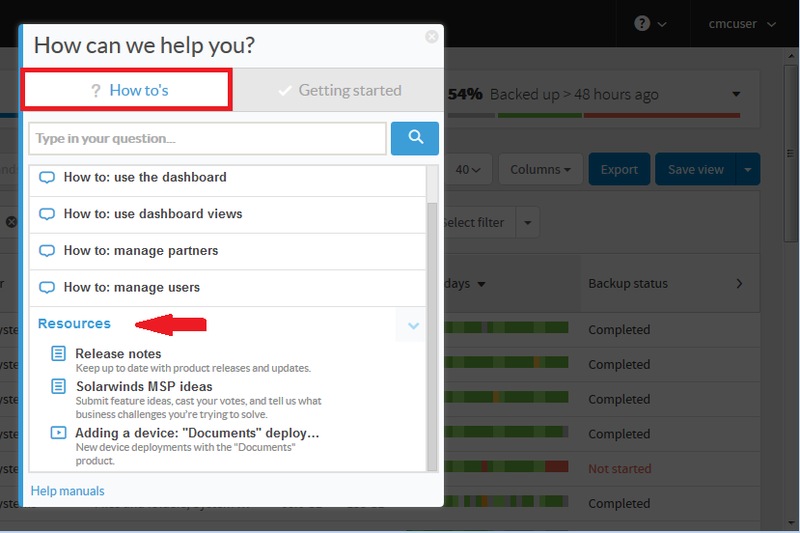 Integrated users of SolarWinds Backup (integrated w/ MSP RMM or MSP N-Central) do not currently have access to these enhancements. Primary development efforts are focused on the online version of our Management Console and no updates are required on your part to access these features. 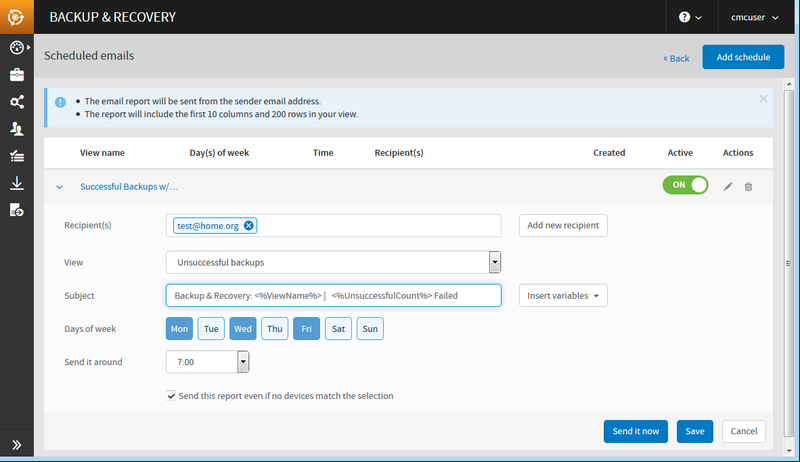 This entry was posted in Backup & Recovery, Backup & Recovery (Standalone), Backup & Recovery release notes. Bookmark the permalink.